The other day, Mike at Pedro (the Ape Bomb) wrote a fun post on the Bollywood artifacts and decor in his office. I loved getting to know about the space Mike spends his days in and, more importantly, how he has made it his own and taken his love of movies and his fantastic aesthetic sense to work. Want to peek at mine? 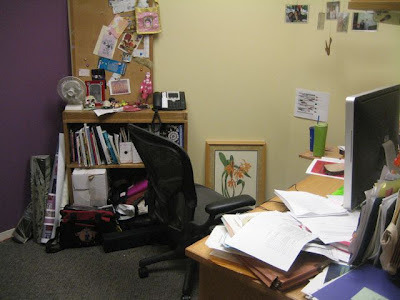 Many of you know that I work in a museum of world cultures at a university; what you may not know is that, like Mike, I have really, really wonderful colleagues who value making work a fun and meaningful environment, so my office has been allowed to ramble wherever my heart and eyes take me. Several other people have workspaces as, er, exuberant and personalized as mine, including my boss. I've been in this particular space the whole time I've worked at the museum (12+ years! ), so the layers have really begun to accrete. I am a zillion times less tidy than Mike. The big blank space on the yellow wall really screams out to be filled. I'd hang something up, but I keep thinking I'll need to have shelves built there to hold my ever-mounting piles of papers and books. On to the filmi artifacts, all of which are gifts, which is absolutely perfect because one of the things I love most about Bollywood fandom is all the dear friends I have met without who have become such an integral part of my life. This hilariously wee Amitabh Bachchan-emblazoned bag was sent to me by the excellent Jo of the Ganesha shops in London. I think the image is supposed to be in the style of rickshaw art. I love that the biggest star of all of Hindi cinema is surrounded by a field of glued-on gold flowers. I put him here on purpose; the bulletin board reminds me of an extremely haphazard altar area (and in fact two items I contributed to our staff ofrenda during a Dios de los Muertos exhibit years ago are there as well), so of course the principal idol should be there, and it also seemed right that he was facing any visitors to my office, both as protector and host, the perfect patriarch. He sees—and possibly judges—all. 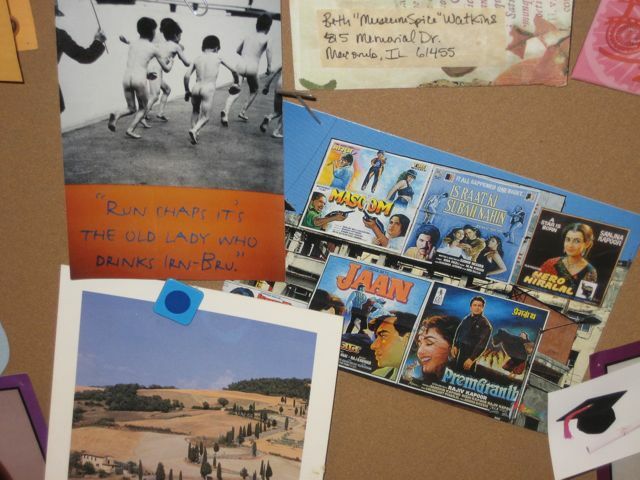 Geetanjali mailed me this postcard of movie hoardings. Who doesn't love movie hoardings! A paritcular highlight of this collection is the ad for Hero Hiralal proclaiming "A star is born" next to Sanjana Kapoor's name. To quote Wayne Campbell: NOT! In the top right corner of this picture you can see the edge of the pink badge everyone was given at the second Pan-European International Bollywood Blogger Meetup in 2008 made, I think, by Kaddele. I'm embarrassed to admit I've fallen out of frequent touch with the German-speaking Bollywood community but many of them are on Twitter and I have no doubt that branch of my long-lost masala family tree is up to their usual shenanigans (and even welcoming new generations into the fold). 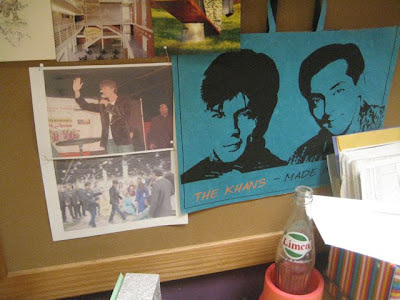 On the wall behind my computer is the Shahrukh area. Obviously Salman is on this folder (given to me by Mrs. Aspi) as well, but when I'm at my computer, which is 95% of the time, he is blocked by the monitor. Sorry, Salman. The photos on the left here were taken by Christy when we saw SRK in Chicago a few years ago. 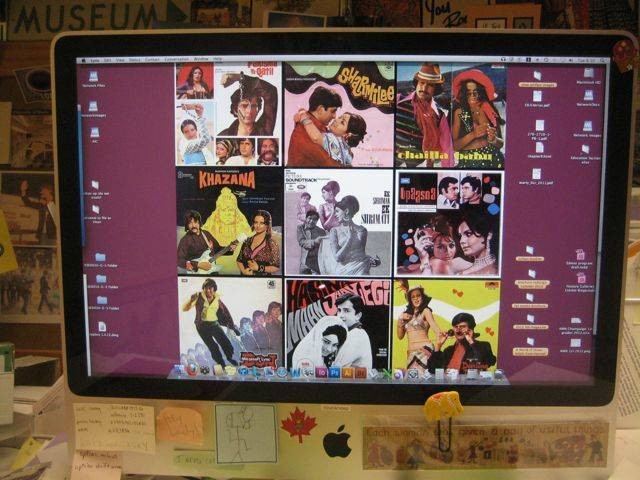 A few months ago I decided my office was not colorful and filmi enough, so I fixed my computer desktop accordingly with a collage of images from Music from the Third Floor's flickr stream. My colleagues love these images and say things like "WOW. Do the movies look like that too?" and I get to smile beneficently at their poor benighted souls and say "Of course." Calvin and Hobbes cartoons (e.g. "What's the point of wearing your favorite rocket ship underpants if no one asks to see 'em?" and "We 'big picture' people rarely become historians"). I'm pretty sure that if you are an academic employee at any American university, you are contractually required to have Calvin and Hobbes and/or Far Side cartoons displayed prominently in your workspace. 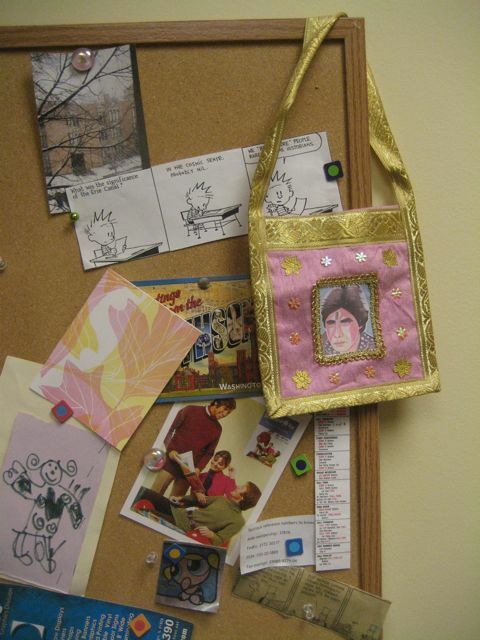 If you gathered all the random India/Bollywood stuff in your guest room (DO NOT TOUCH THE FUZZY PICTURE) and took it into your work office, you'd be that much closer to epic. Rajasthani puppets and a Tardis pen! I now love your office!! !